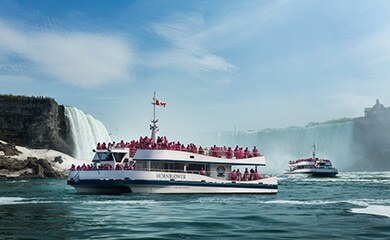 Our Niagara’s Best Tour includes the top 2 attractions in Niagara Falls: Hornblower Niagara Cruises and Journey Behind the Falls. This tour is perfect if you only have a few hours to spare and want to visit the best attractions in Niagara Falls. Our tour includes VIP entrance so you don’t have to wait in long lines. In rare situations, we may need to alter the itinerary outlined above due to unforeseen circumstances. In these cases, we reserve the right to replace an attraction that we are not able to make part of your experience with another. Full pre-payment is required to confirm your reservation. A full refund will be issued when a cancellation request is received 48 hours prior to your reservation. After 48 hours, we are more than happy to reschedule your tour or issue a credit to be used at a later date. Any USD rates quoted on this website are approximate and based on an exchange rate on the day of purchase. Your card will be charged in Canadian dollars. Transportation, expert tour guide and entrance fees included for all attractions. Take a legendary Falls boat tour which has been thrilling visitors for more than 150 years. Hornblower Niagara Cruises offers you an exciting new way to experience the breathtaking Niagara Falls. The state-of-the-art catamaran boats take visitors to the base of the American Falls and then on to the basin of the Canadian Horseshoe Falls. It’s a half hour thrill of a lifetime! Journey Behind The Falls consists of a tunnel running directly behind the Canadian Horseshoe Falls. 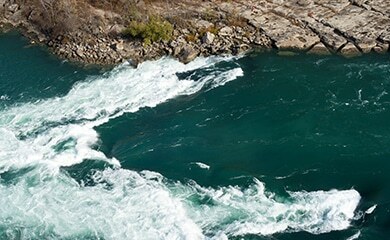 You will journey deep within to touch the heart of Niagara. Before you, the mighty river explodes after free-falling more than thirteen stories. The sound is magnificent; the sight, awe-inspiring. Raincoats are provided. Stop at Whirlpool Observation Deck for breathtaking scenic photo opportunities. View the wonder of the Whirlpool class 4 rapids at a unique point from the whirlpool viewing deck. A beautiful place to take pictures! Sign up to be a Magnificent Tours Insider and receive info on exclusive deals, discounts, contests and more! You may unsubscribe at any time by using the “Unsubscribe” link at the bottom of our emails.